A house designed with ceramic, vinyl or porcelain tile looks highly elegant and stylish. Tile is also durable and comes in a wide variety of options, which makes them ideal for any home design. They are easy to clean and maintain. They are also highly aesthetic and functional, which makes them perfect for homeowners looking for a practical modern look. Tile can be used in wide areas ranging from the bathroom to kitchen, entryway floors and hallways. They are the best choice if you are looking to add value and style to your without investing excessively. However, despite tile being durable and easy to maintain, it’ll require proper care and attention to keep it sparkling for many years. Although you can clean the tile yourself, it is wise to hire a professional tile and grout cleaning expert every once in a while. Getting a professional cleaning will help ensure that the tiled surfaces are in excellent condition at all times. While most people quote the fees of a professional cleaner as the reason why they cannot hire one, you have to understand that you risk losing more by doing the cleaning yourself as opposed to hiring an expert. You must realize that although tile is a tough material that is composed of sand, natural clay and water fired in a kiln to a great hardness and density, it can still become dull or damaged without proper care. For example, if the spills, dirt and grime are not cleaned for a long time, they can discolor or stain the tiles and grout. Moreover, if the wrong products are used to clean the tiles, they can permanently stain the grout and hence, the need to be careful when choosing the cleaning agents. Furthermore, using abrasive cleaning products or scrubbing too hard can scratch the tiles and make them lose their luster. You also need to note that cleaning surfaces that see a lot of dampness such as bathroom floors have their own challenges. If the cleaning is not done by an experienced professional cleaner, you might experience challenges such as mold growth, soap residue and water spots. You might also find that some areas of the tiles and grout are cleaned better than others. To avoid experiencing these tile and grout cleaning challenges, you should always hire a professional tile and grout cleaner company like us at TruRinse to clean and maintain your tiles. 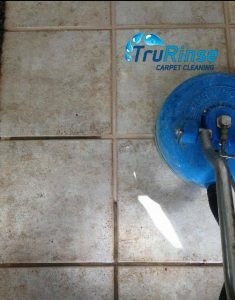 TruRinse is a professional cleaning company in Utah with a highly trained and experienced team of technicians who will leave your tile and grout looking exceptional. Armed with effective products, techniques and tools, our technicians will leave your tile floors not only looking noticeably cleaner but outstandingly looking new. In conclusion, if you are looking to keep your tiles looking great for longer, you should hire the best professional tile and grout cleaning company to clean and maintain your tiled surfaces. With a professional cleaning company like us, you can be assured of superior results that will make your room feel fresher and comfy. You can also relax easily knowing that only quality cleaning techniques that are ideal for your tile and grout are used and hence increased longevity of your tiles. If you have any questions or if you’d like to book an appointment by phone, please feel free to give us a call at 801-226-6827. You can also start the booking process by visiting this page of your website (TruRinse.com/book). Our kitchen is almost all tile. We’ve never had it cleaned before, and the grout looks pretty disgusting right now. I hope our tile and grout hasn’t reached the point of being stained, like you mentioned. We’ll have to hire a professional to come and clean it up as soon as possible to avoid that!